After winning its conference tournament this last weekend, the Wichita State Shockers became the first Division I men’s basketball team to enter March Madness undefeated since the 1991 UNLV Runnin’ Rebels. Wichita State was also the first team to go 30-0 in the regular season. A feat like this requires some degree of luck. There is never a game in which a team has 100% win certainty, no matter how the weak competition. That said, it is certainly a lot easier for a team playing consistently weaker opposition to run the table. The perfect Shockers actually had a very average strength of schedule. 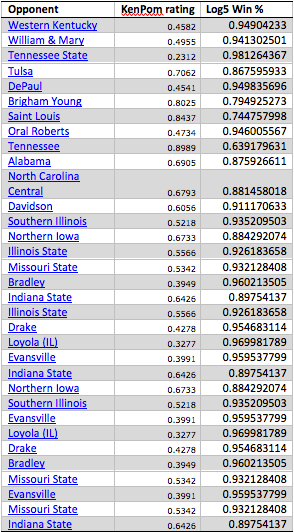 According to KenPom.com, Wichita State’s Pythagoras strength of schedule was .531, good for 131st out of 351 teams. This means, against an average Division One opponent, the Shocker’s competition would win 53.1% of games. This is slightly above average, but not strong nonetheless. On the other hand, Wichita State’s Pythagoras rating is .9403, good for fourth in the country, behind three major powerhouses: Arizona, Louisville and Florida, suggesting that even considering the relatively weak schedule the Shockers were pretty good. So the question remains, how likely was their run? I did not count the first game of Wichita State’s season because it was against a non-D1 opponent. The remaining 29 games featured some strong teams, including probable tourney teams like St. Louis and Tennessee, the second of which Joe Lunardi’s Bracketology predicts to be an at-large 11-seed. Clearly, the shockers have been very lucky. They didn’t suffer injuries to any major players, and play in the Missouri Valley Conference, a conference that is suitably weak to cultivate an undefeated campaign. Nonetheless, Wichita State is a team to reckon with going forward. This season has not been a simple cakewalk for them; opponents like Tennessee, St. Louis and Brigham Young posed a significant threat to their perfection. Unless the selection committee shocks (pun intended) the nation, Wichita State will be a number one seed after reaching the Final Four last season. Will they reach the Final Four once again? That remains to be seen, but just like their perfect season, it will require a lot of skill and a little bit of luck.